This photograph of one of Havana’s busy piers documents the vitality of the port at the turn of the 19th century, and the amount of goods—like sugar and tobacco—that passed through Havana. The photograph comes from the Detroit Photographic Company, one of the largest publishers of postcards and photographic prints in the US in the first part of the 20th century. In the 17th and 18th centuries, Havana suffered persistent ocean-side attacks by British, Dutch and French corsairs and pirates. Maps of the city, some of which appear in Vistas, feature the fortified wall built to protect the port. 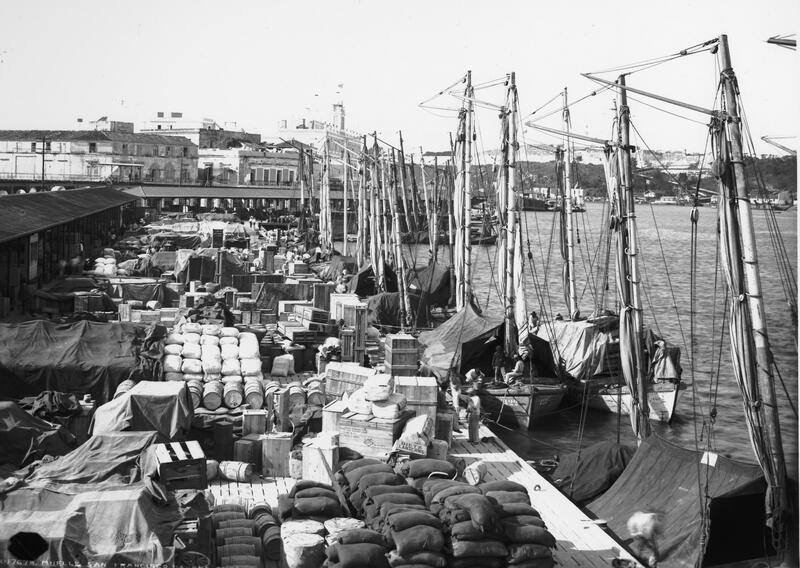 In this modern photograph, the quantities of crates, barrels and sacks makes clear not only how much merchandise passed through the port at Havana, but also its variety. A box in the right foreground is labeled Dietz Lanterns, a well-known company making lamps, with its primary factory in the United States. The only people visible in the photograph are men, suggesting that business at the wharfs was a highly gendered activity. The name of the photographer is no longer known, in part because the Detroit Photographic Company published the work of many photographers. Images of Cuba became particularly popular after the Spanish American War (1898). During the company’s most vibrant period, early in the 20th century, the Company sold millions of prints and postcards every year. This photograph, like many from the Detroit Photographic Company archives, was printed from a glass negative, measuring 8 x 10 inches (ca. 20 x 25 cm). Today the glass negative is in the collection of the Library of Congress, it is part of Detroit Publishing Company Collection transferred to Washington, D.C. from the Colorado Historical Society in 1949. 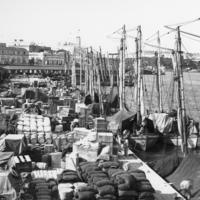 The port of Havana has been the lifeblood of the city since the 16th century. By the late 18th century, just about the time that earthquakes devastated Antigua, Havana emerged as one of the largest cities in the Americas, boasting more than 80,000 residents. In the minds of visitors, the Cuban city was an exotic and temperamental place, buffeted by hurricanes, protected by fortified wall (parts of which survive today) and peopled by tens of thousands of blacks and mulattos, both slave and free. Its landowners were rich from cattle, sugar and, increasingly, tobacco. Havana’s fortunes—for those who lived there and those who visited—were nevertheless constantly tied to the vitality of her port. Detroit Publishing Company Collection. Library of Congress. Martín Zequeira, María Elena and Eduardo Luis Rodríguez Fernández. 1995. La Habana colonial, 1519-1898: guía architectura. Havana and Seville: Ciudad de la Habana, Junta de Andalucia.